Procol Harum stood apart for its aptitude to blend classical figures with rock motifs without coming across as self-indulgent or contrived. Graced with commanding mood pieces, the group's 1969 album – appointed with evocative artwork that pays homage to the Player's Navy Cut logo – exhibits the band's distinctive talents and genre-jumping breadth with an idyllic fusion of performance, composition, and sound. A call for "all hands on deck" opens Procol Harum's third album, and with the command, an effort that witnesses the band coming into its own as a collective capable of fusing classical structures with rock motifs via an expertise, virtuosity, and style matched by none of its peers is on its way to making history. 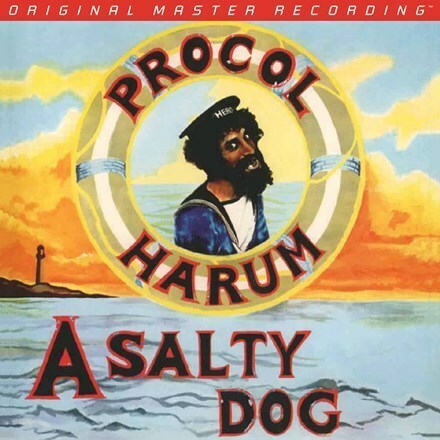 A Salty Dog survives as proof no other artist ever sounded like Procol Harum – while also demonstrating few collectives boasted a lineup full of such ace instrumentalists. Stacked with exploratory themes, boundary-crossing directions, and sweeping melodies, A Salty Dog proudly veers off traditional course and ventures to intrepid places forbidden to even the most thrill-seeking groups of the highly experimental era. The intertwined symmetry between organist Matthew Fisher and pianist Gary Brooker, central to every song on the set, gets revealed with newfound detail, openness, and clarity. Produced by Fisher, A Salty Dog now resonates with a presence and immediacy stunted on prior editions. The full-bodied tones, front-to-back imaging, and grand dynamics inherent on this audiophile edition elevate the 1969 favorite to landmark status. In addition, the evocative cover art, which pays homage to the Player's Navy Cut logo, is reproduced in faithful-to-the-original fashion. The cinematic breadth of the sonics parallels the scope of the bold arrangements, which include strings, recorders, bells, celeste, and a myriad of guitars. Brooker and Fisher split vocal duties, save for on "Crucifiction Lane," which boasts a rare lead from marvel-in-the-making Robin Trower. The latter's prodigious guitar lines add another distinctive element to the compositions and further up the ante of the interplay between Brooker and Fisher. Trower accents tracks such as the topsy-turvy "The Milk of Human Kindness" with bluesy vibes and jolts "Juicy John Pink" by way of jukejoint energy. Not to be outdone, B.J. Wilson's still-unsung percussion draws from R&B and swing techniques to supply a natural albeit firm footing. For all the proficient playing and narrative storytelling, the most impressive feat surrounding A Salty Dog remains its accessible complexity and relative modesty. Procol Harum never comes across as pretentious, self-indulgent, or contrived. Anchored by Fisher's unique Hammond M102 organ riffs, the works function as a summation of their parts. Tunes like "Wreck of the Hesperus" serve as wondrously varied tapestries stitched with swelling chamber rhythms, barbed thickets of distortion, and thundering progressions. It's a ravishing picture of majestic subtlety and sheer power. NME wrote shortly after the record's release that "the most exciting facet of this tremendous album is not so much that it contains the Procols' best recorded works to date, but that their potential is still nowhere near being fully spent." Rolling Stone concurred, observing, "‘Too Much Between Us' is the kind of song you can float away on – its background and vocal of marimba and acoustic guitar in a perfectly understated waltz-time are beautifully ethereal." This album, the group's third, was where they showed just how far their talents extended across the musical landscape, from blues to R&B to classical rock. In contrast to their hastily recorded debut, or its successor, done to stretch their performance and composition range, A Salty Dog was recorded in a reasonable amount of time, giving the band a chance to fully develop their ideas. The title track is one of the finest songs ever to come from Procol Harum and one of the best pieces of progressive rock ever heard, and a very succinct example at that at under five minutes running time -- the lyric and the music combine to form a perfect mood piece, and the performance is bold and subtle at once, in the playing and the singing, respectively. The range of sounds on the rest includes "Juicy John Pink," a superb piece of pre-World War II-style country blues, while "Crucifiction Lane" is a killer Otis Redding-style soul piece, and "Pilgrim's Progress" is a virtuoso keyboard workout.